While the nations of the world are experiencing unprecedented and rapid environmental changes, human economies and civilisations are at the same time undergoing robust transformations. The environment-development debate has centred on the relations between economic arrangements and environmental change at different levels and scales. The major concern has been how to negotiate policies at the local, regional and international levels that will make economic growth more “green” (that is, environment-friendly). Exploring the connections between economic arrangements and environmental concerns is very useful, as it forms the basis on which developmental policies and environmental sustainability planning are made. This paper discussed topical issues bordering on carbon-footprint-reduction-pathways, thereby presenting Eco-capitalism as a possible way forward. Economic arrangements refer to the mechanisms, systems or institutions that define the production, distribution and consumption of products and services within a society . The notion of global economic arrangements centres on the economic partnership and agreements that determine how states and regions allocate their resources and distribute their goods and services across borders . Eco-capitalism, also known as “green capitalism” or “environmental capitalism”, is a concept which assumes that the environment possesses useful natural capital flows and that environmental problems can be resolved through market mechanisms and market-based policies . The concept entails that; first, environmental goods can be commodified and, second, capitalism must not be laissez-faire, rather regulation and governance are required. Around the 1970s, throughout the developed nations such as the UK and the US, there were substantive efforts in separating the state and the economy, as well as integrating world's individual economies into a single economic system . Prior to this period, there was a massive failure of collectivism (mechanisms that give priority to people over individuals), and every other economic model apart from capitalism . Unlike other economic mechanisms, the survival of the capitalist economic arrangement has been argued on the basis that total reliance on free trade agreements and Laissez Faire Capitalism spurred individualism and engendered economic growth [4,5]. However, robust studies of global economic trends have shown that "Laissez Faire" capitalist economic arrangement (that is, economic activities with no government interference), both at the regional and international levels, has fulfilled its goal of stimulating economic growth at the expense of environmental quality [6,7]. Although the environment provides substantial economic benefits and functions, the capitalist market mechanisms have failed in assigning values to environmental resources and services . Studies show that attaching price tags on environmental goods and services provides an incentive to protect them [6,8]. In this paper, we argue that if the value of environmental resources remains unknown, abuse will likely be inevitable. The paper aims to critically analyse the need to attach values to environmental goods and services in order to better incorporate them into the global capitalist market. In pursuing this aim, we also offered recommendations/work plan for robust political negotiations and policies across scale to inform the green growth agenda. We combine systems theory and the paradigm of a steady state economy to 1) establish the link between the economy and the environment, and 2) justify the need for eco-capitalism in achieving a green economy. Furthermore, we utilised case studies to enrich perspectives for eco-capitalism within the economic growth-environment nexus discourse lines. The paper proceeds as follows. Section 2 employs the systems theory to establish the connection between economic growth and environmental change. Using case studies on the European Union Emission Trading Scheme and Payment for Environmental Services in Hoima and Kibaale, Uganda, section 3 presents the arguments for a green capitalist economy. Section 4 evaluates the steps necessary in transitioning to a green economy, & how to negotiate policies across scale to spur green growth. The final section outlines the conclusions drawn from the paper, placing the emerging lessons within the broader context of the literature. Economic growth is widely conceptualised as the expansion in the quantity of products and services a state produces over time. It is traditionally determined by the rate at which the Gross Domestic Product (GDP) increases . GDP is defined as the monetary equivalent (usually in US dollar values) of the aggregate quantity of products and services produced within any economy at any period . To the neoclassical economists, the ultimate aim is to achieve continuous growth in the economy. Economic arrangements are structured to maximise economic growth and social benefits . Strengthening global economic growth forms the fundamental aim of several international agreements and organisations, such as the World Trade Agreement (WTA), the World Bank and the International Monetary Fund’s [IMF] . The underlying concept of sustainable development challenges the notion that greater wealth will always translate to greater welfare and progress for all. When an economy grows quickly, income is usually not fairly distributed among the citizens of a state . Apart from inequality within nations, there is also the problem of income inequality and economic disparity between the developed and developing nations. According to UNEP , economic growth is not adequate to maximise social welfare if it lacks elements of inclusiveness and fairness. Furthermore, the current rate of growth has been found to correlate with unsustainable resource use (extracting natural resources beyond the invisible threshold of natural resource regeneration), fostering distributive injustice and undermining the capacity of future generations to meet their own needs . The concept of sustainable development entails that economic growth must integrate social justice, intergenerational equity, and environmental quality . This simply means that the economy is supported by a “metabolic flow” from and back to the environment . In using the phrase ‘metabolic flow’ or metabolism , likens the economic system to a human system which can ingest food substances and excrete waste material, and that a change in one component of the system affects the other. The ‘source’ that the earth’s natural resources offer is not infinite; meaning that it can be used up . If this is the case, one can reasonably argue that the current capitalist economic arrangement which drives continuous economic growth, without considering negative implications on the environment, will only end up depleting the resource base on which the economy depends. Again, since the capacity of the earth’s sink, such as the ocean and the atmosphere, which represents the repository for the waste produced from economic activities, is also limited, the unregulated release of economic waste will end up deteriorating the earth’s sink. This means that the capacity of the earth’s environment to take in waste products of economic metabolism and transform them into risk-free substances will be undermined. This causal complex nexus has led to the popularity of eco-capitalism amongst policy-makers and academics . Smith and Prothero [2,16] attribute the prominence of eco-capitalism to the emerging desire to maintain a strong business profitability in light of the possibility of degrading the earth systems. Discourse on achieving green capitalism was one of the two themes of Rio+20– the sustainable development conference of the United Nations [UNCSD]. This concept of sustainability proposes for a shift from economic growth to sustainable development. The World Commission on Environment and Development (i.e. the Brundtland report) defined sustainable development as “development which meets the needs of the present without compromising the ability of future generations to meet their own needs” . This means that development efforts must be “… conservative and based on long term optimisation of biosphere resources” . However, weak sustainability approach (the idea that natural resources or natural capital can justifiably be substituted for capital goods) does not make any sense. He contended that sustainability will only make sense through a strong approach (natural capital cannot be substituted for capital goods), but that this approach is totally impracticable. In line with OECD , this paper argues that the practicality of green growth (eco-capitalism) seems to presents a new and more realistic approach to increasing capital profit, exiting from the current economic emergency and at the same time treating the environment as a growth stock. The next section presents the arguments for Eco-capitalism as a reliable development alternative for maintaining viable economies considering the urgent environmental concerns. 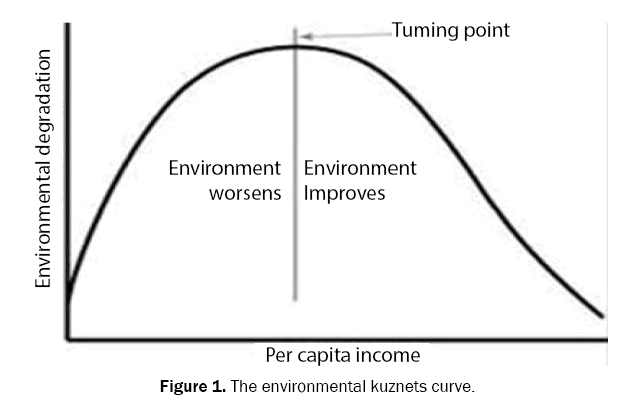 An important illustration that captures the relationship between economic growth and environmental quality is the Environmental Kuznets curve. Kuznets hypothesised the relation between economic growth and the environment to be of an inverted U-shaped relationship (Figure 1). Figure 1: The environmental kuznets curve. The argument is that as the economy grows (measured by the GDP per capita income), environmental degradation rises, up to a certain turning point known as the economic threshold (when the majority of the populace live above poverty line) beyond which further economic growth reduces environmental damage . Although this proposition is highly argued, the relationship suggests that at a certain point in economic advancement, nations begin to prefer environmental improvements over increased consumption such that investments in abatement and conservation dominate spending on consumption. Galbraith  argues that this preference and improvement in environmental quality will be as a result of states’ conscious efforts in abatement and not that economic activity in and of itself reduce environmental damage. The question remains: how will the green capitalist economy help in achieving a viable economy simultaneously with increased environmental quality, before and after the Environmental Kuznets’s turning point? The green economy is based on the ecological concept of SSE . The steady state economy strikes a balance between achieving optimum growth rate and environmental quality. Daly  describes the idea of the SSE as a system consisting of a constant stock of manmade capital, constant population and a constant flow of natural capital. The SSE presupposes that when population and economic activities are maintained in a constant state, natural resource use and recycling will also be maintained at a constant rate such that resource depletion will not occur. This concept differs from Smith, Ricardo and Mill’s theory of the stationary state. While the stationary state theory suggests that the unrestrained free market mechanism (the invisible hand), with no external intervention, is capable of surmounting any economic and environmental problem such as market failure, pollution and overpopulation, the steady state economy proposes the need for government intervention in enforcing sustainable resource use. The steady state economy concept aligns closely with the public interest theory . Public interest theory stressed the need for governments to maintain a position as a maximizer of social welfare, to regulate the economy and put the brakes on economic activities when necessary . Therefore, substitution of natural capital for manmade capital must be regulated by the government both at the local and international scene, through policy tools, such that the rate of resource use will not exceed the rate at which the environment recovers. Proponents of the self-regulating free market and the laissez-faire capitalist economy insist that the market has a way of bringing about efficient allocation, just distribution of resources and optimum scale of natural resource use [23,24]. In other words, the forces of demand and supply in the market will regulate the rate/ scale of resource use. While this may be true for allocation and distribution problems, the opposite is the case for optimum scale. The normal approach employed by laissez-faire capitalists in dealing with scale issue is by subsuming it under allocation . They claim that if the right market prices of capital goods and services are determined, the problem of resource overuse wouldn’t arise. But they fail to acknowledge that scale (in terms of natural resources), which is the physical amount of resource flow from the environment, and waste released back to the environment is a function of population and per capita resource use. Its essence depends on the capacity of the environment to regenerate and assimilate waste, and not the forces of demand and supply. Micro and macro-economic variables (market) only deal with price, demand and supply issues and cannot solely regulate natural resource use . Therefore, in controlling natural resource use and environmental wastes, economic mechanisms and government interventions must not be decoupled. They must work hand-in-hand to resolve economic and environmental problems. Several 21st-century capitalists criticise the eco-capitalism notion as being at odds with the ideals of capitalism and conservative ideologies [26-28]. They argue that eco-capitalism must be free from government interventions and environmental concerns should only be addressed by individuals in the free market . By pushing this argument, they ignore the fact that the free market capitalism as we have today has high expansionist tendencies which are very detrimental to the quest for environmental quality. Reforms in eco-capitalism are more progressive and transformative, helping to maintain an optimal economic growth . Their argument is that the various elements of capitalism are enmeshed and each being fundamental to its existence. In other words, any attempt in tampering with one component of capitalism (freedom) will threaten the whole concept of capitalism. However, in taking this stance, proponents of unregulated capitalism subtly evade the concept of market failure as an unavoidable component of the unregulated capitalist economy, which ultimately requires the need for government intervention . First, it makes sure that the use of all resources must be limited to rates that will eventually produce levels of waste that can be assimilated by the environment [the planetary boundary] . In other words, economic inputs must be limited to a level such that the economic wastes produced from that economic activity, for example, industrial CO2 emissions, will not be detrimental to the environment. Secondly, renewable resources must be exploited at the rates that will not go beyond the capacity of the environment to regenerate . Renewables such as the biomass and water resources have their maximum sustainable yields, and we must not exploit them beyond these maximum levels in order not to cause a long-term depletion. Finally, to maintain an eco-friendly capitalist economy, the steady state economy ensures that we harness non-renewables at a rate that do not surpass the rate of developing renewable substitutes . The basic argument here is that non-renewables are resources that can be used up (resources such as fossil fuels and minerals), and it is fine to use them, but at the same time we must go ahead to develop renewable substitutes so that as the non-renewables are decreasing, they can be replaced with renewables that can achieve the same goals, for example, solar energy replacing fossil fuel. The complex and challenging nature of the green economy raises questions concerning governance, levels, and actors involved. Amid this complexity, decision makers at different levels of governance have a myriad of policy choices to regulate resource use: Market-Based Instruments (MBIs), Command and Control approach (CACs), Negotiated Agreements, Information disclosure and Voluntary Regulations . Given the mounting criticism of Command and Control measures for its inflexibility and high transaction cost [31,32], stakeholders have emphasised the need to embrace the emerging hybrid approach, that is, government-mandated Market-Based Instruments. This is based on the fact that environmental challenges can be resolved by employing government-regulated economic solutions, and this can only be achieved by commodifying environmental goods and services. Placing values on environmental goods and services helps to incorporate them into the market systems thereby making it easy to internalise the costs of externalities. Studies show that attaching price tags on environmental goods and services provides an incentive to protect them [6,33]. Failure of the market mechanism in attaching value on environmental goods and services has resulted in environmental degradation . Where values for environmental goods remain under-priced or free, there will likely be the tendency of their being abused or overused . Environmental issues are sorted out by political process. Dietz  pointed out that policymakers and industries can begin to understand and take the issue of environmental degradation serious when they are presented in monetary terms. Environmental economist has devised three approaches in valuing the environment . The first approach is through the Contingent Valuation Method (CVM) which is aimed at determining individuals’ willingness to pay for an environmental good or service . The second method is by determining the opportunity costs of an environmental good or service. This is done by working out the alternative cost of not using the environmental good or the cost of preserving the environment . For instance, the cost of carbon emission can be given as the cost alternative of using a less carbon generating technology. The last method is by using proxies. This is simply by finding the price of market substitutes and assigning this price to the natural resource . For instance, the cost of conserving a fishing site or an agricultural field can be valued with what the farmers gain from those sites within that period. Actors in the field of sustainability have argued that these valuation methods failed to account for the preference for future generations [34,35]. They contend that today’s willingness to pay might be inconsistent with the preferences of the future generations. Environmental economists take this into consideration by discounting future benefits, such that in valuing environmental good or service today, economists reduce its future value based on predetermined discount factor so that the values of environmental goods today worth less than their future values. Also, those who criticise the act of commodifying the environment feel that the environment might be undervalued in the process . However, case studies have shown that attaching monetary values to the environment has helped in achieving a greener economy which is the ultimate goal. Some of these case studies are presented below. Case study 1: The European Union Emission Trading Scheme [EU-ETS]: The EU-ETS started in 2005. The scheme involves over 11, 000 firms that contribute over 50% of total industrial emissions in the European Union . The scheme was established to help the EU achieve the international treaty on greenhouse gas emissions (Kyoto protocol). The goal was to reduce greenhouse gas emissions by 7% by 2012. This scheme involves a multilevel governance approach. The target was set at the international level, the EU as a region adopts her approach for meeting the international target, and each country within the EU produced allocation plan on volume of permit allocated to individual firms. The governments ensured that industries do not emit above a maximum limit known as the cap . If an industry or firm desires to go beyond this limit, it must purchase (through a standard carbon market) extra allowance from another industry/firm whose emission, perhaps through technological advancement, falls below the cap. The forces of demand and supply in the carbon market create a price for emission permits, thereby offering incentives for industries that operate at low emission levels. By monetizing greenhouse emissions, the government can easily distribute tradable permits to industries. Critics of this approach argue that the commodifying act is a way of legitimising environmental pollution which is immoral. “Paying a fee for an action makes it acceptable whilst paying a fine for an action makes it a wrongdoing in society”. However, the responsibility of the state in a liberal sense is to respect people’s rights. Granting people’s right also includes the rights, at an institutional level, to do things which another thinks is immoral . Also, the primary and most important concern is on emission reduction and that must be the basis for judging such a scheme. The European Union climate action report noted that greenhouse gas emission has stayed within capped levels among the industries involved . The report also indicated an improvement in emissions reduction up to 3.35% per annum within the first and second phases, 2007–2007 and 2008–2012, respectively. This report shows that the market-based instrument of cap and trade was an effective approach. Furthermore, Delarue et al. (2008) employed an econometric method to analyse the impact of carbon pricing signal of the EU-ETS in the power sector. They found that it led to a reduction in emission in that sector by up to 60 Mt CO2 in 2005 and 90 Mt CO2 in 2006. Other analyses generated similar findings . Case study 2: Payment for environmental services or benefits in Hoima and Kibaale, Uganda: Payment for Environmental Services [PES] has been described as a transparent way of conserving natural resources by monetizing ecosystem services . It has also been described as a link between environment, rural development and poverty alleviation . It involves the government or sometimes NGOs paying individuals who hold property rights for which environmental services that help to maintain environmental quality. This was the case in the Hoima and Kibaale in Uganda. Landlords in the forest communities of Hoima and Kibaale were paid US$28 annually between 2010 and 2013 in return for ensuring zero deforestation on their lands. Additional payments were to be made if they plant new trees on their lands. According to Jayachandran S. et al. the scheme led to a 6% increase in the annual income of the landowners. After the evaluation of the program, it was found that there was to be 7%-10% reduction in deforestation among the participating communities. Criticisms of PES centred majorly on the inaccuracy in commodifying nature . Although it is difficult, if not impossible to give an actual value to environmental good, the fact remains that in a highly commodified society, the only way the conservation of the environment can be taken seriously is by placing a monetary value on them. Doing little is better than doing nothing . A study conducted by Nzeh  on the economics of deforestation in Nigeria places the total economic value of national losses due to deforestation in Nigeria on an average of a little above ₦11 Billion annually, equivalent of US$31million (compared to ₦15bn, equivalent of US$43 million, lost annually to oil thefts in Nigeria). Commentators on the study indicated that the publication drew the attention of the government to the urgency in checking deforestation in the nation . The request of the delegates at the first preparatory committee of the United Nation Commission on Sustainable Development in May 2010 was that the United Nations Environment Programme [UNEP], United Nations Department of Economic and Social Affairs [UNDESA], and the United Nations Conference on Trade and Development [UNCTD] should collaborate to assess the gains and the risks of transitioning to a green economy . Several other international and regional bodies have also seen the need for adopting a green economic arrangement. According to Nicholas Stern, Chief Economist of the European Bank for Reconstruction and Development and of the World Bank. “Transition to a green economy and rapid structural transformations provide a story of growth and poverty reduction that is attractive and sustainable. The risks of climate change are potentially immense. The benefits of taking action are also clear: we can see that economic development, reduced emissions, and creative adaptation go hand in hand. A committed and strong low- carbon transition could trigger a new wave of economic and technological transformation and investment, a new era of global and sustainable prosperity. Why, then, are we waiting?” . Firstly, we must foster international collaborations, at the same time engage relevant stakeholders to adopt the sustainable development goals. Recent trends in the environment-development discourse show that the concept of sustainability poses some level of challenge to neoclassical (mainstream) economists and politicians. Politicians also want to see the economy grow. This makes it difficult to advance the sustainable development agenda. Therefore, instead of concentrating on building sound sustainable development goals alone, efforts must also be made in finding ways of convincing relevant stakeholders to adopt the sustainability movement . Similarly, there’s need for multidisciplinary engagements, as well as industry-based collaborations to drive development agendas towards green economy pathways. The fundamental benefit of a multidisciplinary engagement in the sustainable development agenda is that various parties will be given the opportunity to make unique inputs to the policymaking process. This is important because embedding environment in the sustainable development goal requires knowledge from different disciplines: the social, environmental and geophysical sciences, including developmental studies . The aim of multidisciplinary engagements and industry-based collaborations is to give individuals and industries the leeway of choosing the least-cost, effective pathways, and the most convenient multidisciplinary approach to achieving the sustainability goals. For instance, the overall aim of the 1997 Kyoto protocol was to reduce emissions by 5.2% below 1990 levels. To realise this goal, different regions were allowed to design ways for achieving their individual targets. The regions also gave individual countries the leeway to fashion out policy tools for achieving the same target. Industries and stakeholders within these nations also devised diverse approaches of meeting the same set of goals. In the report of the Keidanren Voluntary Action Plan, Keidanren pointed out that emission in Japan was reduced by 3.2%. This was attributed to stakeholder participation allowed by the protocol. The WCED (Brundtland Commission) invoked the importance of international relations in achieving the sustainable development agenda. The goal among other things was to unite different nations in pursuing the sustainability goals . This is important because, in the industrialised countries, consumption patterns have been very high over the years, while among the developing nations the basic human needs are not being met . Since environmental degradation and poverty are interrelated , we must factor in the current imbalances in the international patterns of production and consumption. We must reduce wastages among the richer segments of the globe by addressing consumption patterns and unsustainable lifestyles, and at the same time finding ways of addressing poverty among the poorer segments. The green economy agenda must, therefore, accommodate the aspirations and contributions of the poorer nations . To achieve a green economy, the agenda must seek to adopt an alternative progress indicator. The criticism on GDP has already led to the development of several indicators such as the Human Development Index (HDI), Genuine Progress Indicator (GPI), Inclusive Wealth Index (IWI) and others. These alternative progress indicators have been applied in many parts of the globe such as in Australia and some states in the US and have been found to be very useful . For example, the GPI subtracts the costs of the environmental degradation from the GDP, and then adds the monetary equivalent of the non-market activities such as the household and voluntary activities. It becomes particularly interesting when we compare the GDP and the GPI for a country over time. Take for instance the United Kingdom: the result of the comparison shows that the two indicators tended to move together until the 1970s when the GPI rose and then suddenly flattens out as GDP increases (Figures 2 and 3). 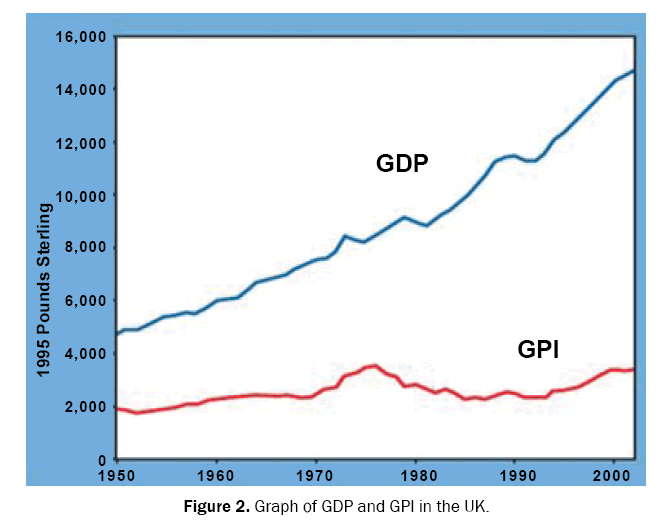 Figure 2: Graph of GDP and GPI in the UK. 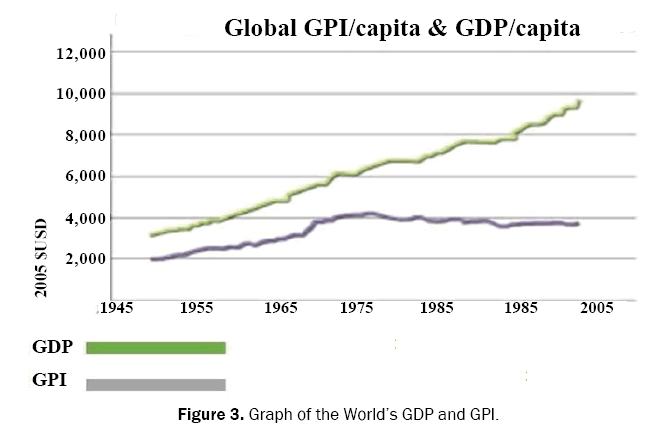 Figure 3: Graph of the World’s GDP and GPI. What both figures show is that, although benefits from economic growth increased over time, at a certain point (i.e. in the 1970's), when the marginal increase in economic activities did not result in any increase in benefit. What this means is that this period seems to be the optimum scale of economic production and resource use in the UK. Similar studies in other developed countries also gave similar results [7,47,48]. The GPI, therefore, monitors the economy and indicates the optimum scale of economic activities. David PA. Papers and Proceedings of the Ninety-Seventh Annual Meeting of the American Economic Association. Am Econ Rev. 1985;75:332-337. Prothero A, et al. Greening capitalism: Opportunities for a green commodity. J Macromarketing. 2000;20:46-55. Egenhofer C. The Making of the EU Emissions Trading Scheme:: Status, Prospects and Implications for Business. Eur Manage J. 2007;25:453-463. Shafaeddin M. How did developed countries industrialize? The History of Trade and Industrial Policy: The cases of Great Britain and the USA. United Nations Conference on Trade and Development; 1998. Harris DJ. The theory of economic growth: a critique and reformulation. The Am Econ Rev. 1975:329-337. Beder S. The environment goes to market. Democracy Nat. 1997;3:90-106. Dietz R, et al. Enough is enough: Building a sustainable economy in a world of finite resources. Routledge; 2013 Jan 4. Pearce D, et al. Blueprint for a green economy. London: Earthscan. 1989. Bjork GJ. The Way It Worked and Why It Won’t: Structural Change and the Slowdown of U.S. Economic Growth. Praeger ,London. 1999. Mojsovska S. Discussion paper DP 29 Macedonia â€TM s Economic Arrangements with International Organizations: Gains and Losses. 2009. Neuman SC. Oxfam: The World’s Richest 1 Percent Control Half of the Global Wealth. NPR: The Two Way, January. 2014;20. UNEP. Embedding the Environment in Sustainable Development Goals. UNEP Post-2015 Discussion Paper 1. 2013;1–38. Bausch KC. The Emerging Consensus in Social Systems Theory, Kluwer Academic New York. 2001. Panayotakis C. Theorizing scarcity: neoclassical economics and its critics. Rev Radical Political Econ. 2012;45:183-200. Barbier E. A New Blueprint for a Green Economy. Submission to the Shadow Cabinet Quality of Life Policy Group Chairman, Rt Hon John Gummer MP Vice-Chairman, Zac Goldsmitj. 2013. Smith R. Green Capitalism: the god that failed. World Econ Assoc. 2015;55-61. World Commission on Environment and Development, Our Common Future. Oxford: Oxford University Press. 1987;42. UNEP. Declaration of the United Nations Conference on the Human Environment - United Nations Environment Programme, Stockholm. 1972. OECD. Declaration on Green Growth. 2009. Galbraith JK. Global inequality and global macroeconomics. Journal of Policy modeling. 2007;29:587-607. Daly H."Smart Talk: Herman Daly on what's beyond GNP Growth". Henry George School of Social Science. 2015. Pigou AC. The Economics of Welfare. London: McMillan & Co,Part IV. 1932. Smythe KR. An historian’s critique of sustainability. Culture Unbound: J Curr Cult Res. 2014;6:913-929. Solow RM. A contribution to the theory of economic growth. 2007;70:65-94. Odum HT, et al. A prosperous way down: principles and policies. University Press of Colorado. 2008. Tanuro D. Green Capitalism: Why it Can't Work. Merlin Press. 2013;112. Homburg S. Critical remarks on Piketty’s Capital in the Twenty-first Century. Appl Econ. 2015;47:1401-1406. Stiglitz,et al. "Thomas Piketty gets income inequality wrong", Salon.com, San Francisco: Salon Media Group Inc. 2015. Juniper T. Capitalism v environment: Can greed ever be green. The Guardian. 2015. Fuentes GK. Neoliberalism, environmental justice, and the Convention on Biological Diversity: How problematizing the commodification of nature affects regime effectiveness. Global Environ Polit. 2013;13:144-163. Lemos MC, et al. Environmental governance. Annu Rev Environ Resour. 2006;31:297-325. Termeer CJ, et al. Disentangling scale approaches in governance research: comparing monocentric, multilevel, and adaptive governance. Ecol Soc. 2010;15:29. Bell K. Can the capitalist economic system deliver environmental justice? Environ Res Lett. 2015;10:125017. Hall PA. Varieties of capitalism: The institutional foundations of comparative advantage. Soskice DW, editor. Oxford: Oxford University Press. 2001. Gore A. Earth in the Balance: Ecology and the Human Spirit. 2000. Caney S, et al. Carbon trading: unethical, unjust and ineffective? Royal Institute of Philosophy Supplements. 2011;69:201-234. Laing T, et al. Assessing the effectiveness of the EU Emissions Trading System. Centre for Climate Change Economics and Policy Working Paper. 2013;126. Tacconi L. Redefining payments for environmental services. Ecol Econ. 2012;73:29-36. Jayachandran S, et al. "Cash for Carbon: A Randomized Controlled Trial of Payments for Ecosystem Services to Reduce Deforestation". Innovations for Poverty Action (IPA). 2016. Nzeh EC. Economics of deforestation in Enugu state. An unpolished Ph.D thesis submitted to the department of Agricultural Economics, University of Nigeria, Nsukka. 2012. Ume CO. Economics of deforestation in Nigeria. Journal of biodiversity conservation and forestry. 2017. UNDESA. Transition to a Green Economy: Benefits, Challenges and Risks from a Sustainable Development Perspective. 2015. Nicholas S. Why are we waiting? The logic, urgency, and promise of tackling climate change. 2015. Jeffery N. Stakeholder engagement: A road map to meaningful engagement. 2009. UNCED. Earth Summit‘92. The UN Conference on Environment and Development. Reproduction, Rio de Jan. 1992;351. Robèrt KH, et al. A compass for sustainable development. Int J Sustainable Dev World Ecol. 1997;4:79-92. Anielski M. The Alberta GPI Blueprint: The Genuine Progress Indicator (GPI) Sustainable Well-Being Accounting System. 2001. World Bank. World development indicators. 2014. Gylfason T, et al. Natural resources and economic growth: The role of investment. World Economy. 2006;29:1091-1115.